NUMBER 660 is an applique pattern using that gentle flower favorite, the pansy, conventionalized somewhat to form a center border which is really just twelve blocks, each 12 inches square. This is surely reducing the number of blocks in a quilt to a minimum, yet their close position on the quilt gives the effect of generous, even prodigal profusion. 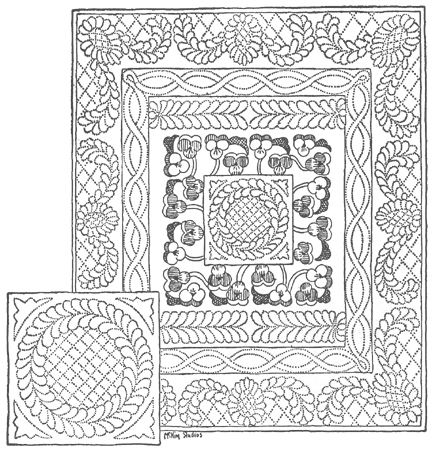 A cutting pattern with instructions and dimensions may be ordered as number 660. This quilt is developed in the triad scheme—two tones of orchid, two of orange, and a soft green which also makes the center square, an outer band and binding with the remainder of white. The size of the finished quilt is 72 by 84 inches. Material assortment used in the original was 4 1/2 yards of white, 2 1/2 yards of green , and 1/3 yard each of the four other colors. We can supply this as number 660A in a fine weave, fast-color percale, or the colors and white of the original in the softest of sheer satine as number 660B. 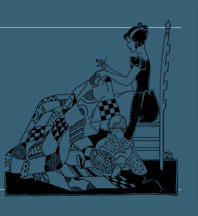 The quilting patterns used in making up this beautiful quilt come separately. The center feather circle is 18 inches across and is in wax transfer form. This is number 252. The other quilting patterns are all perforated on durable paper and may be used over and over again.